What can a CRM do? 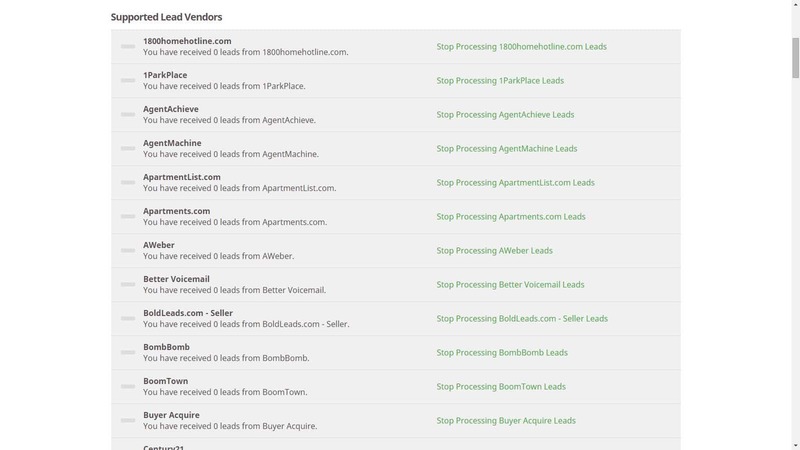 Top Producer/Move.com purchased FiveStreet in order to provide a larger number of sources with which they have a relationship to automatically add leads to it. 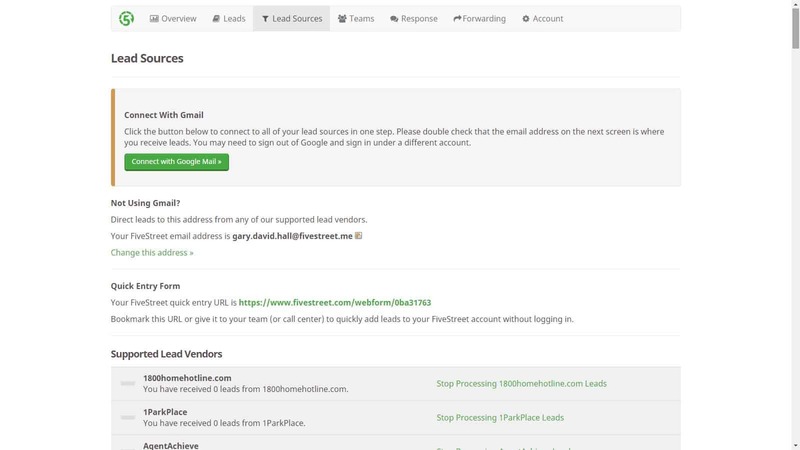 But you can still purchase FiveStreet as a stand alone product to handle your lead aggregation and distribution. Deliver a customized, automatic email and/or text reply to the prospective buyer. Automatically broadcast the lead to your team. Redirect the lead to a different team with a single tap. Get an instant notification as soon as the lead is claimed. 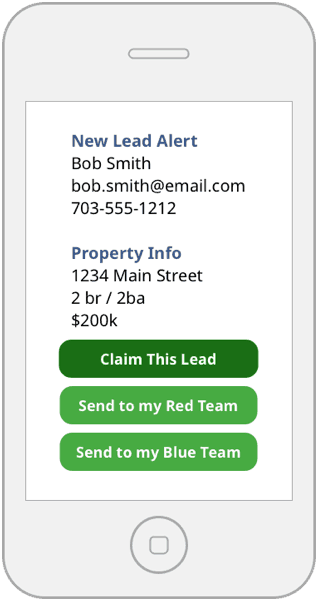 Review prospect details (including social networking information) and property details before calling the lead. FiveStreet also works with your phone leads. Simply enter the lead information into our quick-entry form. 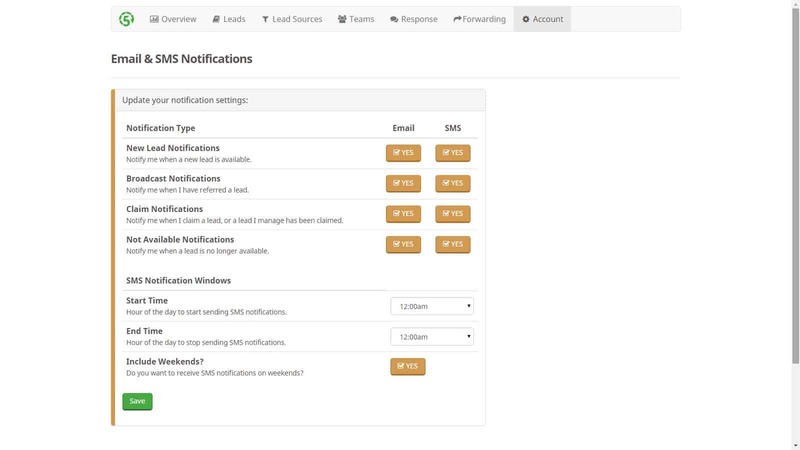 Mobile Notification – Take the lead or assign it to one of your agents. 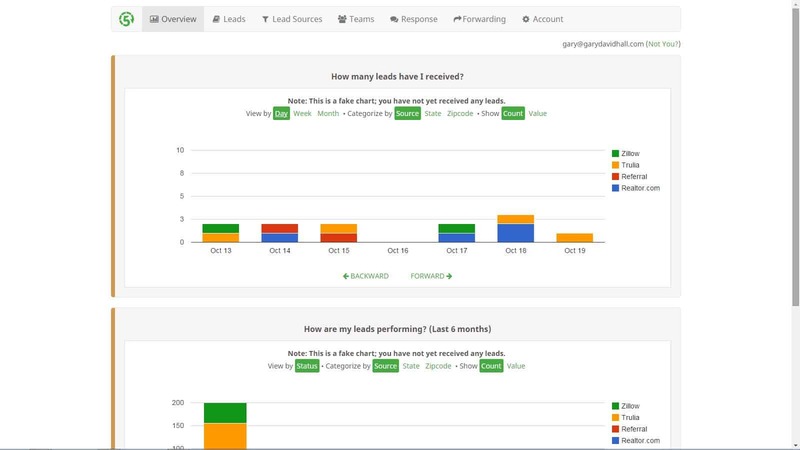 Overview Page – How many leads did you get? Where did they come from? What is their status now? Some questions everyone who is paying for leads wants to know at a glance. 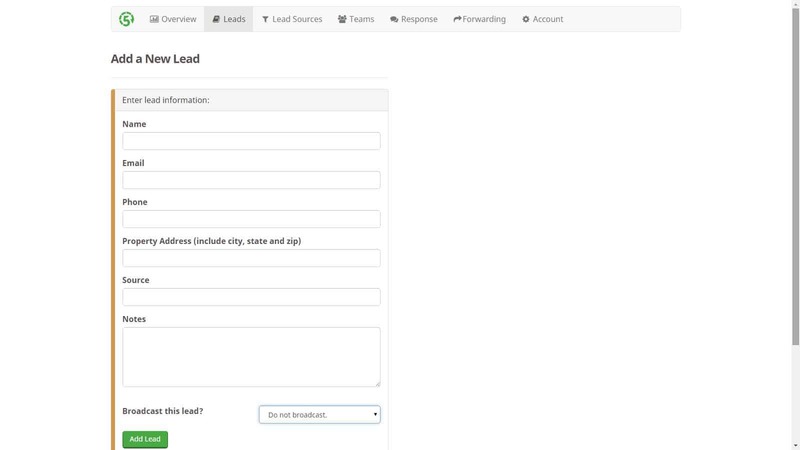 Leads – Shows you the leads that have come in and lets you manually add them. 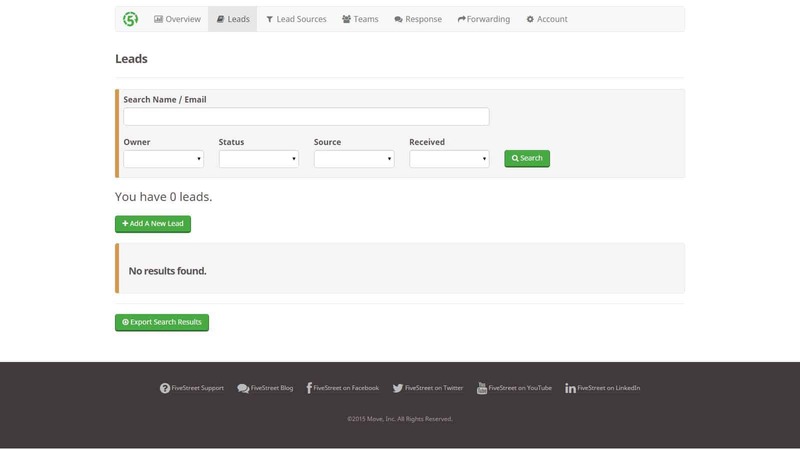 Lead Source – They keep adding more and more sources that they will feed leads to you from. Last count – 186 of them! See the list here. 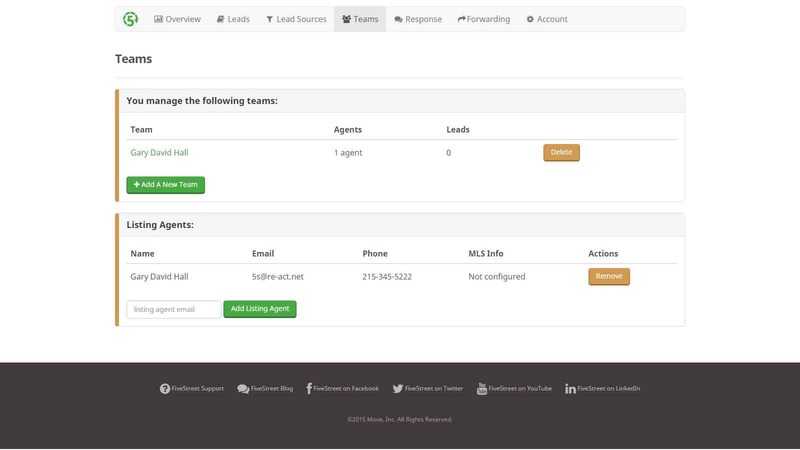 Teams – Set up your agents to receive leads. 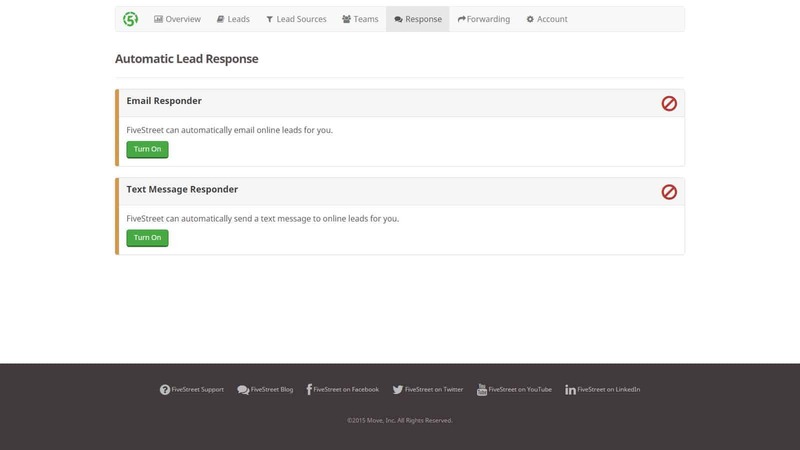 Automatic Lead Response – Set up your auto-responders to start processing that lead and get them engaged. Automatic Lead Forwarding – OK – so you responded immediately, now you need to get the lead into someone’s hands to seal the deal. You can distribute the leads based on getting the lead to the listing agent first, or by source, zip code, or price. You can also send them based on Office hours, and to a team as opposed to a single agent. Then you can re-send it if it goes unclaimed. When it is claimed, you have the option of showing who claimed it. 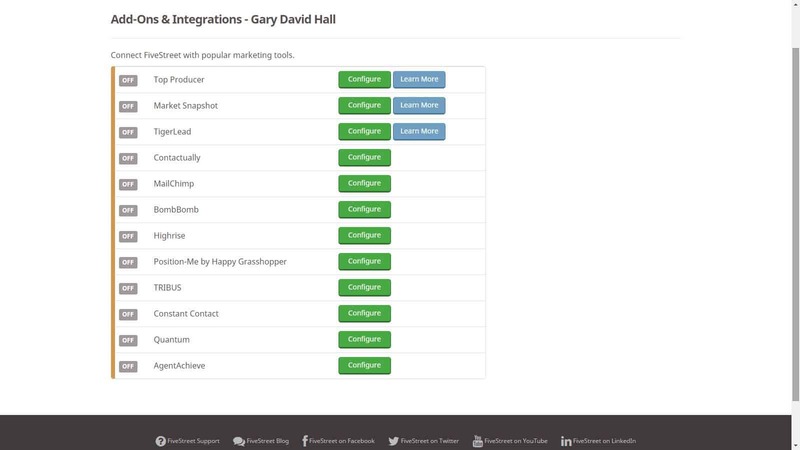 Add-ons and Integrations – Connect FiveStreet with popular marketing tools. Email & SMS Notifications – How and when are the notifications sent. $25 per month per user – BUT, there are package deals available if you are also considering Top Producer and/or Market Snapshot. Contact me for the current lowest prices available for them. $75 per month for up to four users. Larger number of users? Contact me for pricing. Dale Warner on I’m back!!! Rebecca W Baker on Welcome to my new web site!